As a socially responsible company, Medical Properties Trust supports private and public non-profit programs aimed at improving the community and public health through financial support and volunteer commitment. The company and its employees contribute to the United Way of Central Alabama at the “Pacesetter” level, and their contributions of time, talent and treasure to so many other worthy causes as well are making a positive impact across the community. • Committed $2.5 million to the UAB Comprehensive Diabetes Center to support its research efforts to find a cure for diabetes. …plus more than 90 other deserving organizations. At Medical Properties Trust, contributing to the Birmingham Ronald McDonald House is truly a team effort. Ed Aldag serves on the steering committee for the capital campaign to “Expand Our House” and Emmett McLean serves as co-chair of the major gifts committee and as a member of the board. Three MPT employees serve on the junior board and others bring meals to feed the families of children being treated for serious illnesses at Children’s of Alabama and UAB. Ronald McDonald House plays a vital role for these families by providing temporary housing. Each year, nearly 25,000 children undergo surgery at Children’s (where Aldag is a board member) and more than 677,000 receive outpatient care. Often these families cannot afford a place to stay. Alabama, as a state, usually leads the country in terms of diabetes prevalence. This debilitating disease affects an estimated 30 million Americans, including more than 13 percent of Alabamians. According to the American Diabetes Association, nearly one in three Alabamians born after the year 2000 will develop Type 1 or Type 2 diabetes in their lifetime. At the epicenter of this diabetes epidemic, world-class researchers at the University of Alabama at Birmingham are working hard to find a cure – and they are making remarkable progress. The laboratory of Anath Shalev, M.D., who directs the UAB Comprehensive Diabetes Center, achieved a major breakthrough with the discovery that the common blood pressure drug verapamil completely reverses diabetes in animal models. The UAB researchers are now conducting a potentially groundbreaking human clinical trial to assess the safety and efficacy of using oral verapamil to prevent the death of pancreatic beta cells, increase insulin production and improve glucose control in patients who have recently developed Type 1 diabetes. Thanks to a major commitment from Medical Properties Trust totaling $2.5 million over the next five years, the researchers have been enabled to broaden the scope of their work and accelerate their efforts to find a cure. Born in the minds of racing enthusiasts at Barber Motorsports Park in Birmingham who wanted to give something back to the community, Racing for Children’s raises funds to support cancer research at Children’s of Alabama. This year ‘round program also brings young cancer patients out to the track for a tour of the Barber Motorsports Museum and “hot laps” in a Porsche at about a hundred miles an hour – to help them focus on something beyond their cancer treatment regimen. Plus, it brings racecar drivers to the hospital for inspirational visits. Medical Properties Trust stepped up eight years ago to sponsor the first Racing for Children’s racecar – decorated with handprints of Children’s cancer patients – to raise funds and awareness during the Honda Indy of Alabama racing weekend. And every year since, the company has expanded its support for this remarkable cause. To date, Racing for Children’s has raised well over $1 million for the Alabama Center for Childhood Cancer and Blood Disorders (based at Children’s), including the funding of an additional full-time childhood cancer research scientist. In 2017, with MPT’s support, the Racing for Children’s racecar was able to compete not only at Barber’s, but also in the entire IMSA Porsche GT3 Cup Challenge USA by Yokohama series. And our driver, Jake Eidson, brought home the championship trophy in the Platinum class – a remarkable feat that has expanded awareness and support. In celebration of its 100th anniversary, the Kiwanis Club of Birmingham launched a campaign to enhance the north side of Vulcan Park (which the club had helped create in the 1930s) and to extend the Vulcan Trail to Green Springs. The plan includes a new amphitheater that will serve as a special event space and a programmable light show that will spotlight the statue of Vulcan as the enduring symbol of the city in exciting new ways. The extended walking, jogging and biking trail will also serve as the backbone of the proposed 750-mile Red Rock Ridge and Valley Trail system (being spearheaded by the Freshwater Land Trust) that will ultimately crisscross the entire Greater Birmingham area. To help bring the plan to fruition, Medical Properties Trust stepped forward with a commitment of $250,000, spread over five years, to the Birmingham Kiwanis Foundation. When 50 eighth-graders from Phillips Academy visited MPT in March 2017, they had no idea they would be ‘investing’ in hospital real estate before the morning was over. But that’s the kind of thing that happens in the Birmingham Educational Foundation’s “Bridging the Gap” program, which helps kids connect kids to career options early. A host of MPT team members described what it’s like to work in underwriting, asset management, investor relations and accounting, and then the kids broke into small groups for a crash course in real estate investing. Before they knew it, they were ‘buying’ a hospital and defending their choice.Even the teachers and parents who had accompanied them were amazed – and wanted to come back for more. 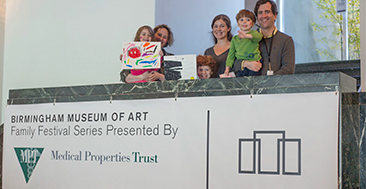 Medical Properties Trust has served as Presenting Sponsor of the Birmingham Museum of Art’s Family Festival Series since 2016. The series enables families to interact with museum objects from seven continents spanning 5,000 years of civilization. BMA’s Hispanic Heritage Festival highlighted the Museum’s Pre-Columbian Art collection and included live performances, scholarly talks, local food and numerous art-making activities. BMA’s African Heritage Festival, celebrated African culture and the Museum’s African Art gallery in partnership with the Ghana Sister City Committee, and included art-making, dancing demonstrations and authentic African music. BMA’s Asian Heritage Festival on January 13th, 2018, celebrated Asian art from the Museum’s Weldon Collection and featured performances of Chinese music as well as Japanese dance known as Butoh. BMA’s Holi (Indian Festival of Colors), to be presented for the third year on March 10th, 2018, in conjunction with the BMA’s Indian Cultural Society, celebrates Spring through classical Indian and Bollywood style dancing and music, food, storytelling and art making. A special focal point is the Museum’s Asian Art collection, one of the largest in the Southeast. Thanks to Medical Properties Trust, children at South Hampton K-8 School in the Pratt City area of Birmingham are now enjoying the benefits of a modern, well-equipped playground “dreamed up” by the kids themselves. MPT partnered on the project with KaBOOM!, a Washington, D.C.-based non-profit that has built thousands of playgrounds across the U.S. in economically challenged neighborhoods. Months of preparation were involved as representatives from MPT’s Charity Committee met with teachers, parents, school officials and community leaders in 2015 to lay careful plans. Under KaBOOM!’s guidance, the kids’ drawings were translated into three different playground designs from which the school picked ‘the perfect one’ to best fulfill the children’s dreams. Playground Build Day drew 150 volunteers to the school site, including dozens of MPT employees and family members, who worked together under KaBOOM!’s direction to complete the playground in a single day! The Salvation Army has been serving the Birmingham community since 1899, making it one of the oldest non-profit organizations in the area. It’s also one of the largest direct providers of local social services. After 50 years in the same location, the Salvation Army developed a new “Center of Hope” on Finley Boulevard – a complete renovation of Lewis Elementary School, originally built in 1928. The 4.1 acre campus also includes three additional buildings that house a 200-seat dining hall, a two-story men’s residential building and a three-story residential building for women and children. Programs and services at the New Center of Hope offer solutions to some of the biggest societal challenges faces by families, young people and neighborhoods – such as poverty, homelessness and education. Through the Salvation Army’s Education and Workforce Development Center, residents can advance their career readiness through basic life skills training, GED preparation and vocational training. A Marketplace Food Pantry gives families and individuals the ability to “shop” for items they need. And transitional apartments support them as they work toward independence and self-sufficiency. The new center also is the home of a new initiative, “Pathway of Hope,” which focuses on solving the problem of intergenerational poverty. MPT joined with other corporations and individuals to make the New Center of Hope a reality by pledging a total of $250,000 over five years toward the successful $15.6 million campaign. Over the past three decades, Smile-A-Mile has evolved beyond just a summer camp on Lake Martin for children with cancer. It’s now a year-‘round program serving pediatric oncology patients, survivors and their families no matter the stage of treatment or where a child is in his cancer journey. To fulfill its year-‘round mission, the program needed a place of its own – “Smile-A-Mile Place” near Children’s of Alabama. In 2016, the organization found the perfect location in the growing Parkside District, within eyesight of Children’s hematology/oncology floor. At Smile-A-Mile Place, children and families who are facing some of their darkest days can come together outside the hospital setting to share in fellowship, support and life-enriching activities. The new location, a revitalization of a 1908 building, also serves as offices for Smile-A-Mile’s growing staff. MPT helped make it possible with a $100,000 commitment to the Smile-A-Mile building campaign. For the past six years, MPT has played a significant role in the March of Dimes’ “Signature Chefs” event. MPT’s Executive Vice President and Chief Operating Officer Emmett McLean agreed to serve as the 2012 event chairman, and his efforts helped the organization surpass $100,000 in contributions for the first time. He then volunteered to lead the charge the following year as the March of Dimes celebrated its 75th anniversary and MPT celebrated its 10th anniversary. And the fundraising effort has exceeded six figures every year since as MPT has continued its support as both the Presenting Sponsor and the “Fund the Mission” sponsor to prevent premature births and help families facing that challenge. When Medical Properties Trust stepped up as Presenting Sponsor of the American Diabetes Association’s 2016 “Tour de Cure” and “Step Out: Walk to Stop Diabetes” at Railroad Park, MPT employees got involved in a big way. MPT formed three corporate teams to participate in the one- and three-mile walks and cycling events that raised more than $200,000 raise to support research, education and advocacy efforts to cure diabetes. The disease afflicts nearly 10 percent of Americans and many across Alabama. MPT employees formed three corporate teams that ultimately led all other corporate teams in funds raised. And Sarah Silverstein, who works with Tim Berryman in MPT’s Investor Relations Department, led all individual fundraisers. More than 40 MPT employees took part – including three cyclists (Jamey Ramsey of Accounting, for 5 miles; Jodi Jackson of Administration, for 28 miles; and Jason Frey of Asset Management and Underwriting, for 100 miles). Three years ago, Medical Properties Trust became part of community initiative dedicated to breaking the cycle of poverty in the Woodlawn community of Birmingham. As part of the Purpose Built Communities network, “Woodlawn United” focuses on three areas: 1) high-quality mixed income housing, 2) a cradle-to-college education pipeline and 3) community wellness. Through its multi-year financial commitment, MPT joined other community-minded companies, foundations and individuals to raise more than $7 million to support a holistic revitalization effort called the “Woodlawn Effect” – including a 16,000 s.f. child development center that serves up to 100 children, ages 0 to 3. MPT also sponsors “Woodlawn Sunday Dinner,” which brings people from the business community and the local community together. In 2015, MPT stepped forward with a pledge of $1 million to serve as the lead gift for a new building for the University of Alabama at Birmingham’s Collat School of Business, where MPT Chairman, President and CEO Ed Aldag has served as a guest lecturer. The auditorium in the new building will be named for MPT and the gift has helped the business school attract other significant contributions – including a second pledge of $1 million from MPT. The company has also supported important endeavors of other colleges and universities, including Birmingham-Southern College’s soccer program and its “Bridge the Future” campaign, as well as initiatives at the University of Alabama (in Tuscaloosa). In addition to MPT’s corporate contributions, Ed Aldag and his wife, Melinda, often make personal contributions to their community and to their alma mater, the University of Alabama. A recent example is the Edward K. Aldag, Jr. Business Plan Competition that they helped permanently endow with their own funds. Each year, under this program, three student teams from the Culverhouse College of Commerce receive a combination of start-up capital and professional in-kind services worth a total of $50,000 – to launch their own entrepreneurial ventures. The Aldags not only believe in and support the idea of giving back to the community, they live it. And their personal example of philanthropy augments the impact of MPT’s corporate contributions. March of Dimes "Signature Chefs"